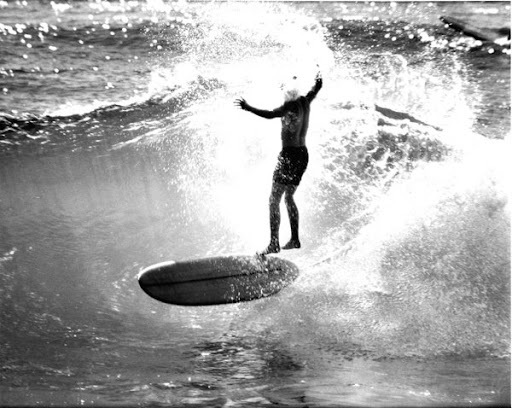 Surfing Heritage & Culture Center: Picture by LeRoy Grannis of "Gecko Toes"
This aerial re-entry was performed at Makaha back on December 19, 1962. LeRoy Grannis was fortunate enough to have been in the right place at the right time to capture this historic moment and put to rest the question of who was the first person to do an aerial re-entry. The rider still remains unidentified, however LeRoy Grannis thinks it could be one of the Makaha locals who everyone knew as "Gecko Toes". For years the surfers at Makaha have practiced various means of using the infamous backwash to their advantage, however in the years prior to the invention of the surf leash, old "Gecko Toes" was the surfer everyone wanted to see.